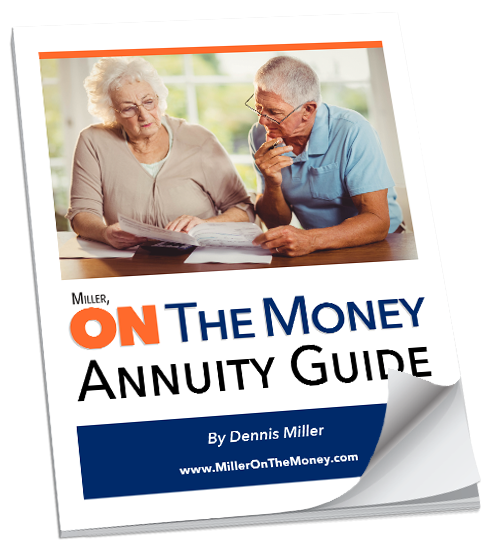 What is the Miller “On The Money” Annuity Guide? Unbiased Annuity Guide Available On The Market Today! Before 2008, retirees had two things: trust in the stock market and a source of safe income. Since then, both vanished: the 2008 stock market crisis and massive bank bailouts destroyed retirees’ portfolios. Safe income floors are no longer around. Bank of America Merrill Lynch reported interest rates are the lowest the world has seen in 5000 years. Individual investors and professional money managers are still desperately searching for safe, good yielding investments to fill the void and provide a comfortable income floor for retirees. A recent survey showed 70% of the respondents planned on working after their normal retirement age. People are afraid they will run out of money, are searching for help and who can blame them? Most educational material is provided by those who sell annuities – promotional reports designed to look like education. Their goal is to persuade the reader to contact them, sell an annuity and earn a nice commission. The Miller on the Money Annuity Guide is strictly for educational purposes. You will not find anything at the end that says, “Call this number for a quote” or be hassled with follow up email solicitations. Annuities are expensive, and (in many cases) the decision is irreversible. Let’s set the record straight: annuities are not for everyone. What are the risks associated with annuities? Am I a candidate for an annuity? What is “income certainty” and how do I achieve it? How does an annuity fit into an overall retirement portfolio? How do I determine my real needs? Is it possible to tailor an annuity to meet those needs? How do I protect from high inflation? How do I keep from getting ripped off? You’ll learn that buying the wrong annuity is worse than buying none at all. Should you decide an annuity is not right for you, the report did the job. Should you feel an annuity might be a possible addition to your retirement portfolio, you will be an educated shopper when you call your financial professional. “I just finished reading your Annuity Guide and my first comment is, where was this 10 years ago when I bought my first annuity. I appreciate your honest approach and your no-nonsense way of explaining it. You are right, if we don’t get it right the first time many of us do not get a second chance. 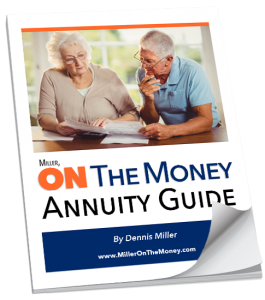 I recommend your Annuity Guide to anyone, even if they are not looking to buy an annuity. This is the best explanation I have ever heard and certainly not from the salesman trying to sell me one.” – V.K. The Miller On the Money Annuity Guide is a comprehensive 63-page (PDF) educational report. It’s affordably priced at $30. No gimmicks, no games, no high-pressure close and no free toaster if you buy in the next 30 minutes. It’s just a darn good value! Click the orange button below and you can download the Guide in a matter of minutes. “When Dennis asked if I would help edit his Guide I told him I have a built-in bias. I have always been skittish about annuities since so many advertise, “guaranteed income for life – never worry again!” I might not be objective. Click Here To Order Guide Now!